You may be able to find the Avengers on the big screen today, but it looks like Hawkeye has already found Firestorm! The results just might be explosive! No, you didn’t miss an inter-company crossover featuring the Bombastic Bowman and the Nuclear Man. This fictitious meeting is the work of a gentleman named Ross Pearsall who runs Super-Team Family: The Lost Issues! That site is dedicated to the greatest team-ups that never happened. He started with Brave and the Bold fake covers starring Batman, transitioned into Marvel Two-in-One fake covers starring the Thing, and is now doing Super-Team Family featuring a wide variety of team-ups. 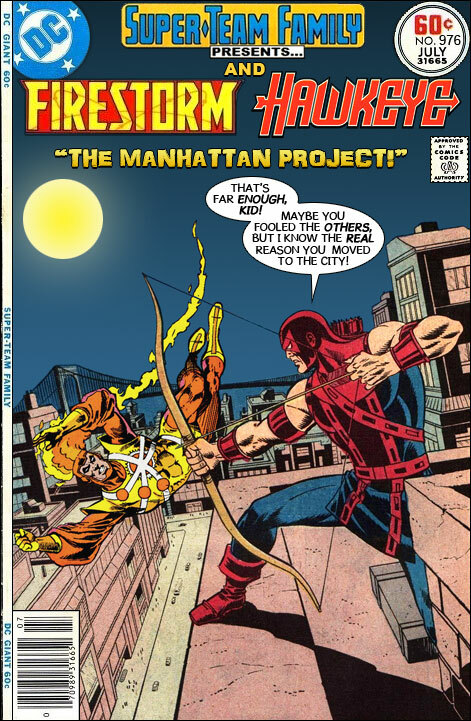 This entry features a Joe Brozowski Firestorm paired with (I believe) a Don Heck rendition of the Avenging Archer! I love Ross’s choice in Firestorm images for this one. This Firestorm art comes from the cover to Fury of Firestorm #48 where he’s up against Moonbow, a female archer! Nice symmetry! On top of all that, Ross is a former letter-hack to the Fury of Firestorm comic! Look for him in letter columns while reading your back issues! Be sure to check out Ross’ work on Super-Team Family: The Lost Issues! Every day there is a new amazing piece! Also, please consider supporting Ross’ efforts via his Patreon page! I did! Support Firestorm (and Super-Team Family)! Fan the flame! Posted in: Comic books, Firestorm #01: Original (Ronnie/Martin), Firestorm comic vol. II, Joe Brozowski.